= "*" & A2:A(whatever number is last) & "*"
write the formula as ="*"&B1&"*" where b1 is the 1st cell containing the number to add * to. press ctrl shift up arrow highlighting all the cells in that column from the last number to top. now highlight the column with the correct values (#) and select copy. right click on the original column letter. delete the column you originally added. You can do this with a basic auto-filled function. 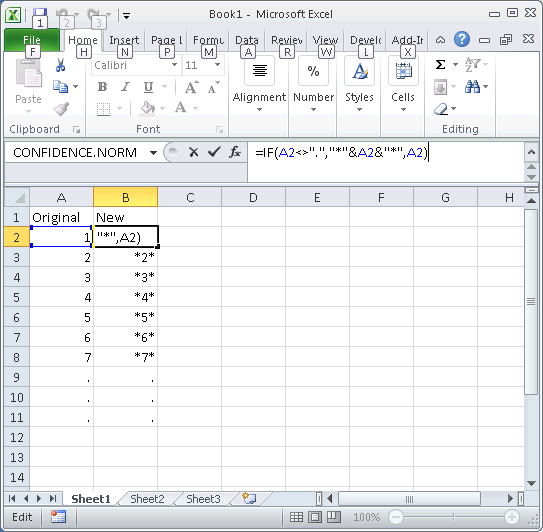 Are you familiar with auto-fill in excel? Not the answer you're looking for? Browse other questions tagged excel excel-formula excel-2013 or ask your own question. How to sum values based on criteria ranges that are both columns and rows?